If all the world, including the world of employment, is, as Shakespeare timelessly suggested, a stage on which we are the players, it can pay to know who or what is writing or calling the plays, the outcomes written into them and the roles we are likely to be assigned, including in the workplace of the future. In its 2010 report, “Managing Tomorrow’s People: The Future of Work to 2020”, PwC (PricewaterhouseCoopers, LLC) purports to have identified all of the above, including, most importantly, the two most important cultural descriptors and prime movers operating behind the scenes as something akin to producer-playwrights and yet also seated in the front row as directors. But what if PwC got it wrong and misidentified the key classifications and prime movers? Simple logic suggests that if the primary causes or labels of anything are misidentified, predictions, classifications and explanations based on them are equally likely to be mistaken or limited. The chief purpose of this analysis is to examine the possibility that the PwC analysis and forecasts are wrong, incomplete or otherwise somehow flawed, while noting the report’s relevant insights and strengths. In a previous article, “The PwC “3-Worlds” Forecast: The Future of HR”, I explored the PricewaterhouseCooper vision of three competing and complementary workplace scenarios PwC foresees as likely to be given increasing play and to play out by the year 2020. What the PwC report called the “Blue World”, “Green World” and “Orange World” are conceived, interpreted and presented by PwC in terms of the intersection of two workplace organizational, functional and structural dichotomies and grid axes: “individualistic-collectivistic” and “integrated-fragmented”—allowing that they may be the three acts of a three-act power play, so to speak, or three independent, possibly overlapping scenarios in a kind of 3-ring employment and business circus. That is to say, PwC identifies the dynamic interplay of integrating and fragmenting forces with individualistic and collectivistic tendencies as the best framework and paradigm for describing, explaining and predicting the future of work and the workplace through the year 2020. Although that interplay of the four variables allows for four combinations, PwC reduced the scenarios to the three colors, as explained in the previous article. In the PwC report’s vision of the future, the Blue, Green and Orange worlds—corresponding to the big, go-it-alone neo-feudal corporation; the social/environmental-issue-focused idealist company; and the small-company networked association of independent “guild” workers, respectively—are evolving from the interplay of the two continua, represented as two perpendicular axes, viz., “individualistic-collectivistic” and “fragmented-integrated”. For example, on the PwC analysis, the combination and interaction of fragmentation and collectivism is spawning the Orange World in which “companies begin to break down into collaborative networks of smaller organizations”, while “specialization dominates the world industry”, in the form of short-term project-based, rather than long-term corporation-based commitment by free-lance guild-based professionals. In the absence of any rigorous definition in the report of the key terms “fragmented”, “integrated”, “individualistic” and “collectivistic”, it appears that this forecast is limited by conceptual problems. Here’s why: Why wouldn’t the collaborative networking that is a defining characteristic of the Orange World not be strong evidence of integration, rather than of fragmentation? Of course, the report’s intent here is to focus on the macro-fragmentation of one large company into smaller components. In this regard, the classification of the Orange World as “fragmented” makes sense—but only relative to the earlier macro-level of organizational description. At the micro-level of each new and smaller component company, the most salient feature is collaborative network integration. Therefore, it is confusing or misleading to characterize the Orange World company as predominantly “fragmented” without specifying whether this is so at the macro-level, at the micro-level or, in the clearer extreme, at both levels. Presumably, pure fragmentation would involve the spun-off fragment-companies operating without integration within any networks. A real-world example of this would be that of a tightly-integrated fast-food corporation that switches to entirely independent, non-communicating, widely-distributed franchises by licensing the use of trademarks, processes, procedures, etc., to the franchisees. Prima facie, this looks like the perfect example of an organizational structure that is “pure-fragmented” (as opposed to “mixed-fragmented”), i.e., is fragmented at both the macro- and micro-levels, unlike the putative paradigm illustration and definition of the Orange World given in the PwC report, which seems to be “mixed-fragmented”. Accordingly, anyone hired and employed within this PwC framework will apparently find himself in an Orange World that is even more totally fragmented than the archetypal Orange World as characterized in the PwC report. This is not to say that the “fragmented-integrated” axis is not a useful analytical, descriptive, predictive and explanatory tool. It does mean, however, that it must be used accurately and precisely, with care taken not to paint different organizational levels with the same broad brush unless the same paint truly should be applied because it applies. The logic of this line of argumentation can also be applied to PwC’s “individualistic-collectivistic” dichotomy. For example, PwC’s forecasts regarding the Blue World hinge on the conceptualization of the Blue World as “integrated-individualistic”. The pressing question is whether these are macro- (and, in the purest case) micro-level structural attributes, as they seem to be in the Orange World, or whether they represent a contrast between integrated macro-level functions and goals and individualistic micro-level employee functions and goals. Given that the Blue World is described as “individualistic” because the dominant goals of both the corporation and its employees are autonomously and individually chosen and pursued—and also presumably not integrated into the broader society’s agenda, the Blue World is “functionally individualistic-integrated”, while the Orange World is “structurally fragmented-collectivistic”. As a result, the two worlds are not being compared and measured with the same yardstick, especially given that structure and function/goals are entirely independent factors and dimensions. Hence, theoretically, how are we to classify a “World” that features structural fragmentation but functional/goal integration? Is it fragmented, or not? What about a world characterized by functional individualism, but structural collectivism, at one or both of the macro- and micro-levels? On this analysis and through this line of enquiry, it seems that comparing the Blue and Orange worlds may be as difficult as comparing blueberries and oranges, if we define one by its structure and the other by its botanical functions, or one at the macro-biological level and the other at the micro-biological level. To sum up, if the litmus test of “integration”, “fragmentation”, etc. is structure in the Orange World case, but functions and goals in the Blue World case, a confusing ambiguity compromises the clarity and utility of the “integrated-fragmented” and “individualistic-collectivistic” descriptive-explanatory framework. An additional observation about the two axes—“individualistic-collectivistic” and “integrated-fragmented”—suggests a trenchant question: Because the two continua are apparently reducible to just one, namely, “a part from” vs. “a part of”, it must be asked whether the two original PwC dichotomies are in fact independent of each other—which they should be if mapped as horizontal and vertical axes representing two independent causal factors or descriptive categories. “Individualistic” and “fragmented” are both forms of being “apart from”; “collectivistic” and “integrated” are both forms of being “a part of”. Hence, it is reasonable to suggest that, in the absence of a clearer explanation of what these two contrasting axes mean, they may be, to some extent, redundant in virtue of not being independent. Technical note: By “independent”, I mean definitionally and causally independent of each other, as the wavelength of red light and the wavelength of the piano note C# are. If they are instead related as dependent and independent variables, as they would be in an equation like Y=2X + 1, knowing one of the two measures, e.g., degree of integration, would suffice for determining the other, e.g., degree of collectivism—which would create a redundancy in the PwC model. Private employee and corporate life will be more closely integrated by the paternalistic Blue World corporation to provide an optimal work-life balance by means of integrated services that blur the boundaries between home life and career. Blue World organizational operations will increasingly become vertically and horizontally integrated in terms of organizational structure, communications and control. In the Green World, the objectives and ethics of society and business will be integrated and harmoniously aligned. The Blue World corporation will cross-market to customers and employees, thereby blurring the distinction between them, by integrating the services previously offered them separately. Blue World vertical recruitment integration, e.g., through secondary school career streaming and early recruitment, apprenticeships, etc., will become more prominent. Blue World corporations will intensify integration of personnel performance metrics with job assignments and rewards, while Green World internal-communications will vertically integrate ethics and values while integrating the corporate mission with that of the broader community. Forces, or Categories of the Future? Fundamental to an evaluation of the PwC models, forecasts and axes is the question of whether individualism, collectivism, fragmentation and integration are actual forces, or merely descriptive classificatory categories. If they are social and cultural forces, they will in fact shape the future of the workplace; if they are only taxonomical labels used to classify the forms of the future, they will help organize our thinking about that future, but without shaping that future. Indeed, they may be only effects of other forces, rather than being prime movers themselves. As an analogical example taken from physics, consider the concept of gravity. Gravity is a force that will shape the future of the solar system. On the other hand, “point mass” and “center of gravity”, while very useful in organizing our thinking and understanding of the effects of gravity are not themselves forces. 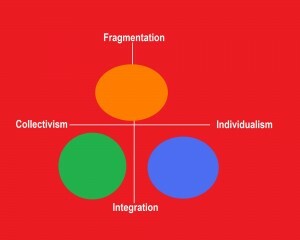 The PwC categories “integrated”, “fragmented”, “collectivistic” and “individualistic” may be like that—just categories, whereas “integration”, “fragmentation”, “collectivism” and “individualism” sound more like forces. The distinction between forces and labels is crucial to understanding the PwC model, since, if these four terms are not forces, the true prime movers of the future of the workplace will remain unidentified, however helpful the terms may be as classificatory labels. This ambiguity is much like that of “Ides of March” in Shakespeare’s “Julius Caesar”. When a soothsayer warns Caesar to “beware the Ides of March”, was he identifying the 15th of March as a mere label for a day, or as an astrological force that would seal Caesar’s fate as assassinated emperor? Analogously, will “individualistic”, “fragmented”, “collectivistic”, “integrated” as labels merely describe your future world of work, or will “individualism”, “fragmentation”, “collectivism” and “integration”—as forces— create and explain it? To explain, or to describe?….That is the question.